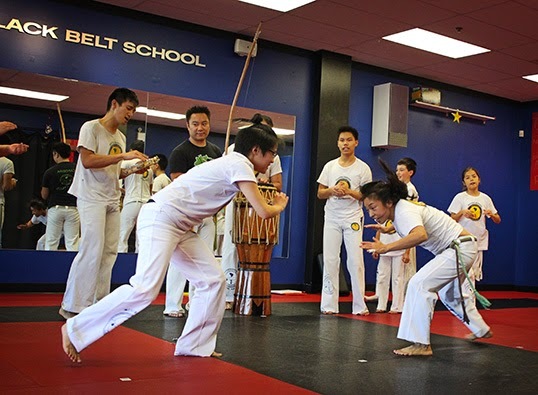 This was exciting and we are so thankful when Daniele Santos, a writer from The Source newspaper decided to do a featured article on capoeira. You should be able to pick up a local copy of the article at your local public library. Training the Marcus Aurelio aka Contra Mestre Barrãozinho special. The switch kick. Awesome video of the time I judged beauty pageant contestants learning martial arts for Vancouver Television. They had 10 minutes to practice a martial arts style and then perform it in front of the judges. Whoever displayed the martial art with the most confidence wins the challenge. The “Ms. & Mr. Vancouver Pageant” Contestants learn Martial arts at Richmond Martial Arts from Vancouver Television. Work on smooth transitioning with lots of bridges and you should get this sequence down. Come join our annual Halloween Roda this year hosted by Vancouver’s Axé Capoeira. Haven’t you always wanted to play capoeira in a costume? Now is your chance! There will be some additional fun activities as well, so try not to miss out. Thursday @ 6pm – 7pm. P.S: Class in Richmond is NOT canceled. After the roda, we will go back to Richmond and train! (Not in costume).